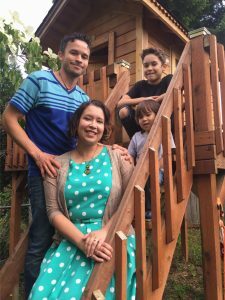 Olivia Salazar de Breaux has lived in Thurston County since she was 5-years-old. Born into a military family, Olivia feels fortunate to have stayed in the area most of her life. She graduated from Timberline High School and earned a bachelor’s degree with an Education and English emphasis from The Evergreen State College. The first member of her family to graduate from college, Olivia has already accomplished much in her young life. I sat down with Olivia to find about her latest venture creating small batch lip butters out of her home in Olympia. Olivia Salazar de Breaux is pictured with her husband, Andy, and sons, Julian and Alejandro. A mother of two young boys – Julian and Alejandro – Olivia was concerned about all the toxic chemicals in the various products she used around the house. She began slowly replacing commercial products in her home with non-toxic options. She experimented with natural cleaning supplies and purchased organic personal care products. 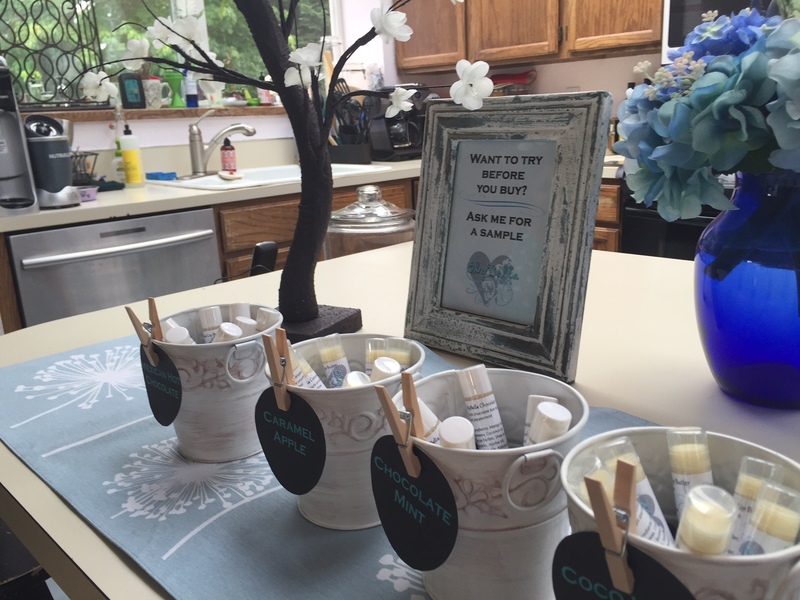 Buying all organic and safe products was expensive and often difficult, but Olivia explains, “I really didn’t want toxic products in my home or on my sons’ skin.” Her “path of awareness,” led Olivia to begin testing out some of her own home recipes. Her two boys loved lip balms and went through them almost as fast as she could get them home. The natural lip balms were expensive, and the artificially sweetened lip balms chapped their lips. It was a vicious cycle and an expensive one. So, she headed to the kitchen and discovered that she could source all of the ingredients needed to make decadent yet safe, lip balms. 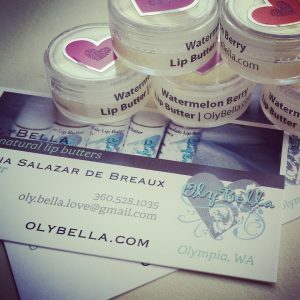 OlyBella lip butters are handcrafted in small batches in Olivia’s Olympia home. In 2015, Olivia gifted the lip balms to friends and family for Christmas and was soon getting requests for more. “I never intended to start a business,” says Olivia. “I have a full-time job I love, and my number one priority is my family.” With friends clamoring for more of her rich, smooth lip treatments, a small local business was born. She named the company OlyBella in honor of her beloved dog Bella who the family lost to cancer. She explains, “Bella radiated pure love and joy. That, to me, is what makes someone beautiful.” Using her marketing and graphics background, Olivia created a beautiful logo and labels for her handcrafted products. Olivia sets aside one day a week to make the lip product that she now calls “Lip Butter.” Maintaining a work and family life balance is always in the back of Olivia’s mind. The side venture allows her the flexibility to work at home and around her boys’ schedule. Testing for her product began as a way for Olivia to reduce the number of toxins in her family’s lip balm. Now that she has perfected the lip base, Olivia has created nine unique varieties of lip butters. Horchata and Mexican Hot Chocolate lip butters flavors pay homage to her Hispanic heritage. There is something for everyone, from Chocolate Mint to Dreamsicle. Olivia enjoys knowing that she is bringing a safe, affordable product with simple ingredients to her own family and the community. The OlyBella name ensures you are buying a safe product with all natural flavors and ingredients such as coconut oil and shea butter. Olivia continues to experiment with new flavors and is interested in finding some local partners to source ingredients like the beeswax she uses in her lip butter base. ThurstonTalk first met Olivia when she organized the area’s Out of the Darkness Community Walk. To read more about her early life and work with suicide prevention and awareness click here. Samples of OlyBella are pictured along with Olivia’s contact information. Ordering is available online. 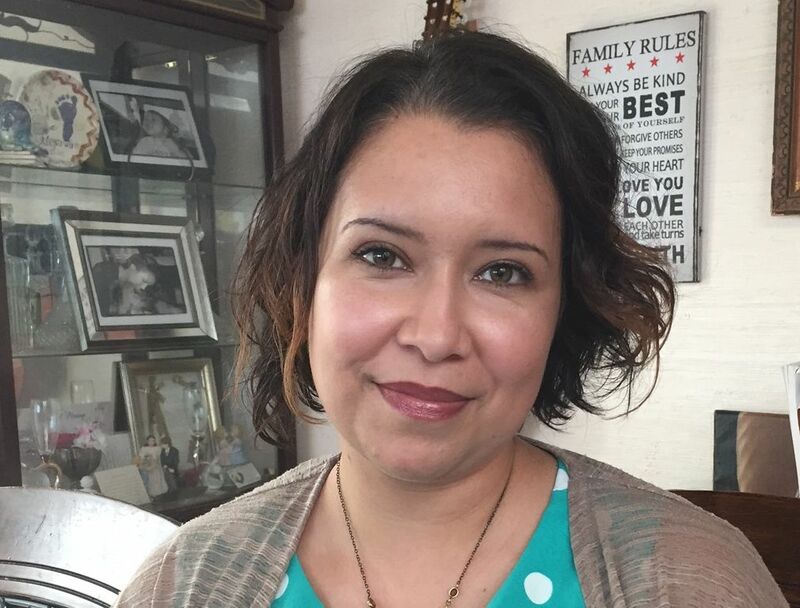 Olivia continues to enrich her community as a board member of the Hispanic Roundtable of South Sound (HRT). The HRT is a non-profit organization that includes both Hispanic and non-Hispanic professionals working to strengthen the community through partnerships and education; and link Hispanic youths with resources and mentors. Their largest annual event is the Latino Youth Summit. This event brings over 500 Hispanic youths to a college campus. This experience helps them to envision themselves on campus and see themselves earning a college degree. Olivia hopes to inspire young people in the way that she was encouraged to pursue education by those she met along the way. This summer Olivia will attend monthly vendor fairs, including the 80th Annual Strawberry Festival at the South Bay Grange to sell her products in the community and is looking forward to sharing the OlyBella name. She is also working on finding locally owned venues to sell her lip butters. OlyBella products are currently available online at OlyBella.com and locally at A Beautiful Face and Skincare on Union Street in Olympia.